Discussion in 'Player Profiles' started by OSUBasketballJunkie, Jun 26, 2014. Is Arnette still an option for Cats? Ohio State has offered Damon Arnette a scholarship. How does that impact Kentucky's standing with the Florida cornerback? I see this kid blowing up real soon. Solid looking DB prospect. Arnette will take an official to OSU on Jan 31. Michigan offered today and he'll visit there Jan 16. Another name that wasn't listed on last month's edition is Damon Arnette from Florida. The St. Thomas Aquinas cornerback is currently committed to Steve Spurrier and the Gamecocks, but he is taking some visits. The 6'2, 185-pound prospect is currently in Ann Arbor for an official visit with the Wolverines. He will then head to South Carolina's campus and make their official. The weekend after his official in Columbia (SC), Arnette is planning to see the Buckeyes campus in Columbus on the 30th of January. 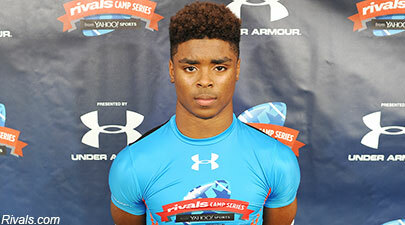 Arnette is a three-star and the 60th-ranked CB in the 2015 class. Davis out === Arnette IN ??? According to 24/7, Urban will visit Arnette today, then Arnette will be in Columbus tomorrow. AZBuckeye and wesbranscum like this. I'm so glad Code is not around to see this! Trading a 4* for a 3*? Are you kidding me?! "Today's" big news was the information that Carlton Davis would not sign with Ohio State next week and would flip to Auburn instead. Of course, if you're a reader here you knew this was going to happen a few days ago because we've been beating that drum all week. The player most likely to replace Davis in the Buckeye recruiting class and in the Buckeye secondary is St. Thomas Aquinas (Fort Lauderdale) three-star Damon Arnette. The 6-foot-2 Arnette will check out Ohio State starting tomorrow and tonight he has a pretty important Scarlet and Gray visitor. Now before he's too quickly mocked for a typo, Arnette immediately corrected his spelling and prepared for tonight's visit. As for the Buckeyes, they believe Arnette is a player who would fit nicely into their secondary, capable of being a cornerback or a safety much like Davis. The Buckeyes feel they're in a good position to land the South Carolina commit this weekend. "He'll get a lot of attention this weekend," one source at Ohio State shared. "Distance isn't a factor because it's a flight to here or there, we have the last visit and there's that Ohio State/Aquinas connection. He has not said he's committing or anything, but there's a lot pointing towards him maybe flipping." Arnette visited Michigan previously and right now this could be more of an Ohio State vs. Michigan battle than Ohio State vs. South Carolina, according to people in Fort Lauderdale.